Home > CCTV Security Camera & Video Surveillance System Forums > Surveillance Camera System & Digital IO Burglar Alarm Integration > Can HD Security Cameras Detect Motion to Trigger Recording on a DVR? This topic contains 0 replies, has 1 voice, and was last updated by Mike Haldas 1 year, 8 months ago. Can HD Security Cameras Detect Motion to Trigger Recording on a surveillance DVR? This is a question that I recently received from a customer that purchased an AHD-BL25 wide angle security camera with an iDVR-PRO security DVR. Yes, HD CCTV cameras (AHD, HD-TVI, HDCVI) can all be configured for motion detection as long as your DVR supports it. For the iDVR-PRO that you are using, you can learn how to set up video motion detection here. You can also learn about how-to avoid false alarms in this article. Please note that outdoor video motion detection can be tricky because of the elements that exist in nature that create motion. Also, some night time / infrared applications are tricky to avoid false alarms because of the video noise that infrared can product. If you have setting up video motion detection outdoors, an alternative solution is to use an outdoor PIR motion detector, which is wired to the alarm input of the DVR. 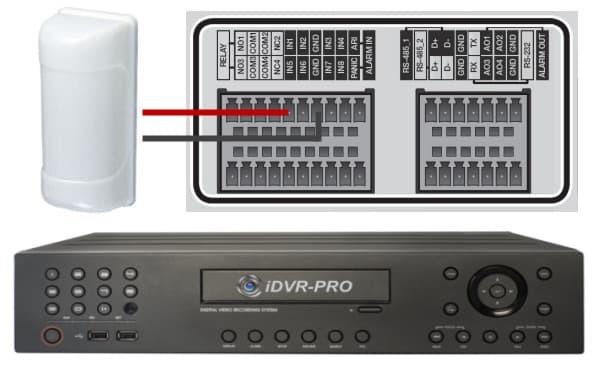 The DVR can be configured to trigger recording on one or more security cameras based on motion from the external motion sensor. You can learn more about this here.